Going green is fast becoming a lifestyle for me. You might have noticed that I’ve even changed my header to reflect that. But besides beauty products, I’ve also been using more cleaner and greener household products to battle the dirt and grime at home. It all started with the Method All-Purpose Surface Cleanerâ€”a product I’d used, liked and then re-purchased. I found the brand to be cheaper at iHerb.com and began buying other products like the dish soap cleanser and hand wash. Soon, one thing led to another and I was ordering other brands of earth friendly household products. I realized that once you use go green, it’s a bit hard to turn back. Suddenly, the non-green options look like poor choices. Like I recently reverted to using the brand Cif for my bathroom and I almost suffocated from what came across as seemingly toxic fumes. Either I’ve to wear a mask to continue using it or I just have to replace it with something that is kinder to my nose. Anyway, this post is not about bathroom cleaners. Instead, I want to show you some of the green brands that have been making their rounds in my home. 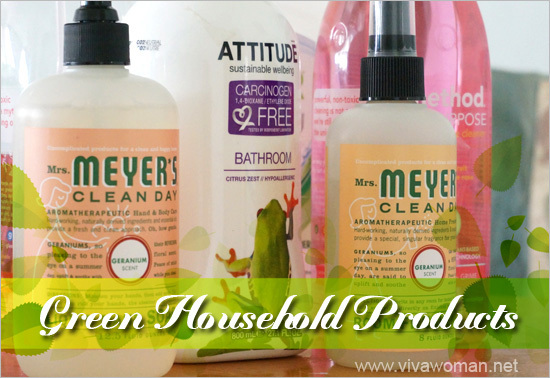 Household products from Mrs Meyer’s Clean Day are not just earth-friendly, they provide an aromatherapeutic experience for the users because they are all made with a combination of essential oils from flowers and herbs plus safe synthetic ingredients. Their garden-inspired fresh scents that include lavender, lemon verbena, basil, geranium and many others are real mood lifters and a treat for those with a nose for the finer things in life. Using mostly plant-based ingredients, Mrs Meyer’s Clean Day products do not contain chlorine bleach, ammonia, petroleum distillates, parabens, phosphates or phthalates. 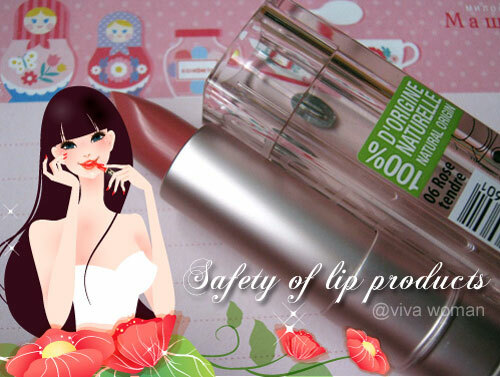 The brand also use concentrated, biodegradable formulas, at least 25% post-consumer plastic in their bottles, and they do not test on animals. 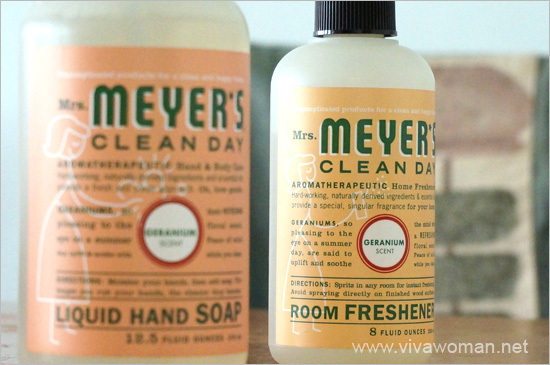 I started out with the Mrs Meyer’s Clean Day Room Freshener and recently ordered their liquid hand soap. I like both products and are definitely planning to purchase more from the brand. 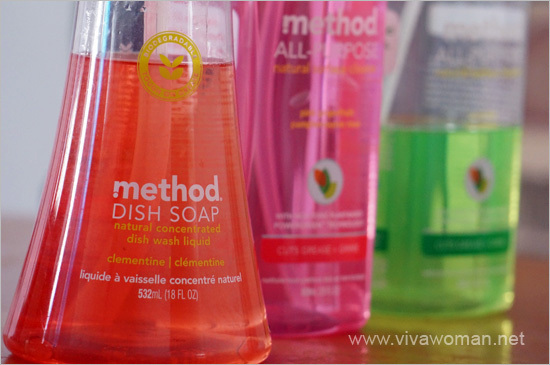 Method is the brand that got me started on green household products. I really like their All-Purpose Surface Cleaner and have purchased like four of them so far. They’re great for cleaning the stove, glass surface, kitchen sink and even the floor. My favorite scent is pink grapefruit and that product is top rated at iHerb.com and often out of stock. I’ve also been using their dish soap cleaner and no way am I going to revert to convention brands. 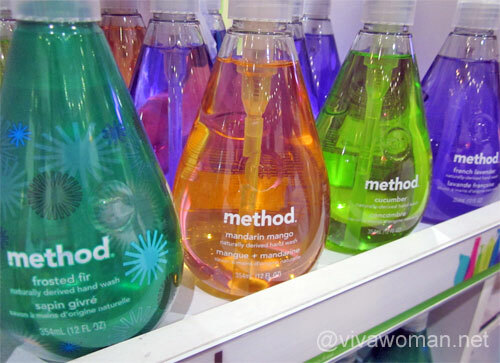 One of the first things that caught my eye about the Method range is the color. Some of the products like their hand wash and their body wash comes in different colors and they do attract attention. It seems that most Method products use only natural or naturally derived ingredients, but in the event where this is not possible, non-toxic man-made ingredients are chosen instead. So “dirty ingredients” like parabens, phosphate, chlorine bleach, phthalates, tricolsan, bisphenol-a, ethylene glycol ethers, formaldehyde, and ammonia are not used in the Method range. The company seems to focus on being environmentally friendly, using safe and sustainable materials and making all their bottles from 100% recycled plastic. They do not test on animals, aim to reduce the carbon emitted by their business, and use mostly natural, renewable ingredients. The other green household brands I’ve tried are Ecover and Attitude. Many of you would probably find Ecover familiar because the brand has been around for more than 30 years. According to the company, they introduced the first phosphate-free laundry detergent. I can’t comment too much about the brand because I’ve only used one product so far. Attitude is another brand that uses essential oils to give off a therapeutic aroma. 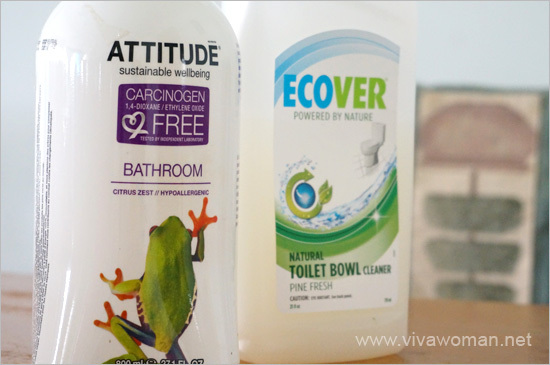 Like the other green brands, Attitude do not contain harmful carcinogens that are known to be bad for our health and that cause respiratory problems. However, I’m not too impressed by what I’ve used from the brand and probably won’t be trying out the brand any time sooner. While most of these products seem to be formulated with naturally derived, skin-friendly ingredients, I noted that some of them do contain sodium laureth sulfate (SLS). Colorants are also quite common in many products and I spotted methylisothiazolinone and methylchloroisothiazolinone that function as preservatives in some of them. Even their fragrance is not 100% natural but is a combination of natural plus synthetic ingredients. Still, compared to conventional household products, these products are less toxic and kinder to our skin and health. As to whether they can perform to combat the dirt and grime, my experience tells me they do. I have no issues using them to wash my dishes and clean my stove. As a matter of fact, some of them do so well for me that I’m happy to repurchase them over and over again. Do you believe in using green household products to battle with the daily dirt and grime at home? If you’re currently using some green household products, do share about them with us in the comment box. Get green household products from iHerb. If youâ€™re shopping at iHerb for the very first time, you can enjoy US$10 off if your purchases are $40 and above (US$5 if below $40). Use my promo code OVO966 (affiliate). Shipping is speedy: you have a choice of using DHL, which takes three days to arrive from US to Singapore. I pay US$4 for the shipping via Singpost and it always takes about five days with no issues. Anyway, you’re given a tracking number if you ever need to locate your parcel. 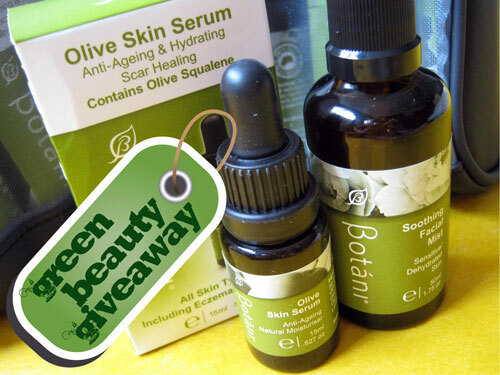 A Method to keep yourself and your household clean 6 Green Makeup Products I’m Using Now Green Beauty: botanical products from BotÃ¡ni Green beauty: lip products be made as safe as food? Good post a lot of people are under the impression that these products don’t work very well. Well, some of them are useless but others are as good. I have yet to try detergent for clothes so cannot really recommend. If you shop at iHerb, look up their reviews on the detergent to have an idea. I usually zoom in on the top rated ones. Check out iHerb…they ship internationally at a very affordable price. If you use my promo code stated in the post, you’ll get $10 savings if your order is above $40 or $5 off if your order is below.